The Kenai Peninsula offers some of the best sport fishing in Alaska and perhaps the world, and Alaska Hooksetters Lodge is strategically located to be very close to the heart of it all. In addition to the world famous sport fishing opportunities, the Kenai Peninsula is well-known for many other great and memorable adventures. Whether it's salmon fishing charters, halibut fishing charters, volcano tours, day trips and more, booking Alaska Hooksetters Lodge as your "base camp" will help complete your dream Alaska vacation experience. Perfect for couples vacations, family events, corporate retreats or fishing buddy outings! 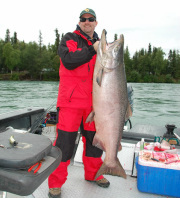 Learn More - Alaska Salmon Fishing Charters. They're bigger, heavier, live longer and grow stronger than any other Pacific salmon species - Kenai Alaska's King Salmon fishing brings thousands from around the world each year . . .
in one of the most memorable sport fishing adventures. Trout are abundant on the Kenai Peninsula and can also be huge. Set your hooks into some incredible sport fishing. Once in a lifetime opportunities abound to see bears, Alaska wildlife and more - a tourist and photographer's dream. The Kenai Birding Festival happens every year here in May and there's a reason. Hundreds of rare, unique, native and interesting species of birds in Kenai. No fishing vacation in Alaska would be complete without taking the opportunity to explore some of the regions most remote fisheries - by float plane. How often do you get the chance to hop on a small plane and see four active volcanoes up close and personal? That's right, never. Here is your chance . 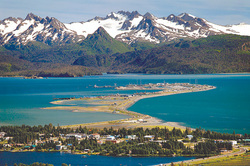 . .
Day trips from Kenai to even more unique Peninsula opportunities. You Alaska vacation never ends . . . .